Washington: A study published on Wednesday in the journal Science has confirmed that liquid water is present on Mars. Italian researchers using radar to probe the planet's polar ice caps have detected a lake of liquid water under the Martian ice, stretching 20 kilometers across, according to the study. The detection was made using the Mars Advanced Radar for Subsurface and Ionosphere Sounding (MARSIS) instrument on the Mars Express spacecraft, launched by the European Space Agency in 2003, Xinhua reported Thursday. MARSIS sent radar pulses that penetrated the surface and ice caps of the planet, then measured how the radio waves propagated and reflected back to the spacecraft, providing scientists with what lies beneath the surface. Between May 2012 and December 2015, Roberto Orosei with International Astronomical Union and his Italian colleagues used MARSIS to survey a region called Planum Australe, located in the southern ice cap of Mars. They obtained 29 sets of radar samplings, mapping out an area exhibiting a very sharp change in its associated radar signal, about 1.5 kilometers below the surface of the ice and extending sideways about 20 kilometers. The radar profile of this area is similar to that of lakes of liquid water found beneath the Antarctic and Greenland ice sheets on Earth, suggesting that there might be a subglacial lake at this location on Mars, according to the study. Although the temperature is expected to be below the freezing point of pure water, they suggested that dissolved salts of magnesium, calcium, and sodium, known to be present in Martian rocks, could be dissolved in the water to form a brine. Together with the pressure of the overlying ice, this lowers the melting point, allowing the lake to remain liquid, as happens on Earth, according to the study. 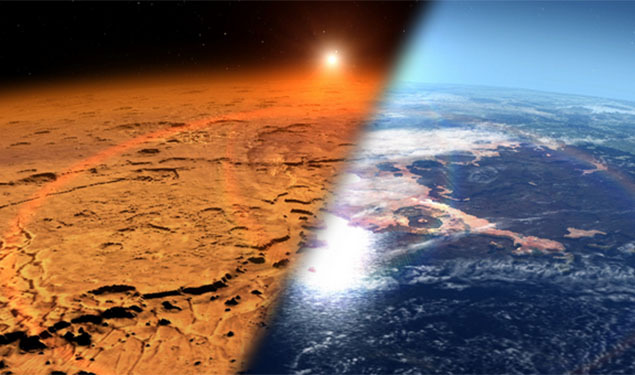 "This is a stunning result that suggests water on Mars is not a temporary trickle like previous discoveries but a persistent body of water that provides the conditions for life for extended periods of time," said Alan Duffy, associate professor from Swinburne University who didn't participate in the study.